In recognition of career-long contributions in promoting global exchange among professionals in upstream oil and gas operations, and for his outstanding leadership in the petroleum industry as an executive of one of the world's largest oil companies. 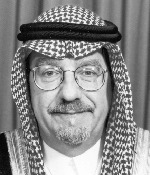 Dr. Al – Husseini joined Aramco in 1972 after obtaining his PhD from Brown University in Geology. He retired from Aramco as a member of its Board and Executive Vice President for E&P in March 2003. Dr. Al - Husseini is credited with leading Saudi Aramco’s upstream organization for eighteen years. During his tenure, he led the establishment of the company’s exploration and petroleum engineering center, the formulation of its reservoir management policies, and the expansion of its production capability from 7 million barrels per day to ten million barrels per day. Based on his leadership, the Company’s reservoir engineering became a leading edge organization within the industry and the exploration programs resulted in the discovery of the Kingdom’ s Paleozoic oil and gas reservoirs and its onshore Red Sea oil and condensate fields. Dr. Al - Husseini guided the successful Saudization of Saudi Aramco's Exploration and Producing organizations and the development of the Kingdom’s hydrocarbon resource management policies.